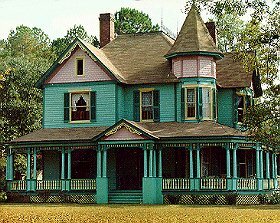 The Henry Bennett House is a turn of the century Queen Ann Victorian and is located in the Historic district of Clio. The exterior is most striking with the enormous wrap-around veranda where guest can set and enjoy a cool summer breeze or go to the back yard and enjoy a swim. The bed and breakfast interior has a gracious entrance foyer with a two landing stairway with detailed and decorative woodwork dowels, spindles, paneling, etc. leading upstairs. As you go up to one of three bedrooms and bath you will enter a cozy little nook. For our romantic quests, there is a working fireplace in each of the bedrooms. Downstairs you will see Sideboard paneled wainscoting and paneled beaded- board ceilings. There are also fireplaces in each room with some ornate mantels and rectangular mirrors. Throughout the house the walls are plaster and the floors are heart pine (narrow-board). Come to Clio and enjoy our Queen Ann and have a homemade breakfast made with lots of LOVE. We're 15 miles off 1-95. The countryside around is predominately rural, quiet, peaceful. This and other Clio Bed and Breakfast Inns can be found here in The Register.